Technique: Yarn applied with latch hooking. The way our society consumes creates a barrier between the items we acquire, where they come from, and where they end up when we discard them. We value fast and cheap, disregarding the social and environmental cost of production and consumption. My project looks more directly at clothing coming from fast fashion retailers, such as Forever 21 and H&M. According to Labour Behind the Label, “The garment industry turns over almost $3 Trillion a year. Yet garment workers, 80% of them women, work for poverty pay, earning as little as $21 a month. Human rights abuses are systemic throughout the industry. Poverty wages, long hours, forced overtime, unsafe working conditions, sexual, physical and verbal abuse, repression of trade union rights and short term contracts are all commonplace in the clothing industry”. This production model creates a mass of cheap clothing but comes at price. In addition to the many social issues this practice causes, it is also incredibly damaging to the environment. According to the Environmental Protection Agency(EPA), 84 percent of discarded clothing in the United States went to a landfill or an incinerator in 2012. 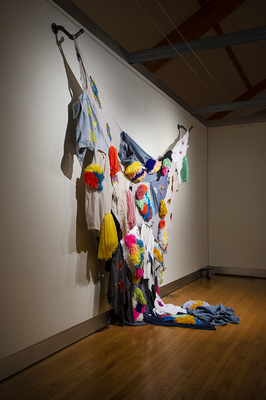 This work is a fiber art installation of fast fashion garments acquired from second hand stores. I stitched them all together creating one body of fabric and hung them from industrial pipe hooks. I covered them with latch hook and beads that are bright and colorful, juxtaposing the dull clothing they are attached to. These additive elements operate in a few different ways. The first being concealment, by adding these decorations I am concealing the issues of fast fashion. However, in covering them with these ostentatious and textural processes, I am calling attention to their problems. These processes are very time intensive, a stark contrast to the quickly produced garments. This references not only my labor but the labor that went into the garment originally. The traditionally feminine garments and the fiber process simultaneously reference feminist art. They both are domestic crafts and have been practiced by women for years. This industry is particularly damaging to women and these processes reference this. When putting together the installation, I let the nature of the materials guide me. The latch hook and beading add visual and physical weight to the items representing the social and environmental burden of this industry. The clothing’s natural desire is to drape and hang, further exemplifying this weight. The extreme stretches of the materials are unsettling and bodily. The viewer when approaching this installation will firstly experience it as one mass of colors but upon additional examination will identify the singular items. This allows the viewer to individually identify with this issue and understand how they fit into this model of consumption. These garments are riddled with many social and environmental problems and it is imperative we try and understand them. © Breann Marie Urlaub, 2018. Photo Credit: Allison Corona.